Andrés Manuel López Obrador won Mexico's presidential election and celebrated Sunday night with his supporters in Mexico City's Zócalo Square. President Trump says he called Mexican President-elect Andrés Manuel López Obrador Monday and spoke for 30 minutes about trade, border security and the fate of the North American Free Trade Agreement. Although Trump has railed against Mexico since his campaign, the U.S. president said he came away upbeat after the talk with his incoming counterpart. "I think the relationship will be a very good one," Trump said, during a meeting with the prime minister of the Netherlands. López Obrador later said on Twitter their half-hour call was "respectful," and that he raised the idea of development projects to create jobs in Mexico, help reduce migration and improve safety. The Mexican politician is known to criticize the U.S. president, including in a book he published last year called "Oye, Trump" ("Listen Up, Trump"). López Obrador, a leftist populist, celebrated an overwhelming victory in Sunday's vote, pledging to stamp out Mexico's corrosive corruption and rampant violence, while helping the poor and working class. That puts López Obrador in the history books. His win — about 53 percent of the vote and as much as 30 points over his closest rival, according to official preliminary estimates — looks set to be the biggest percentage of any president since the 1990s. Not only did his 4-year-old Morena party take the presidency, but the party and its allies also look like they will capture a majority in the lower house, another first in modern Mexican politics. The party also grabbed as many as five governorships and a large number of mayoral posts. Since Mexico began its democratic opening in the late 1990s, no Mexican president has gained such a broad electoral mandate. Analysts say most voters were expressing their anger at the leading establishment parties that have taken turns governing for decades without solving the country's problems. "Let's elect the principal opposition leader and, you know, let's give him enough power to gather enough political capital to push through a new agenda," says Carlos Bravo Regidor, who heads the journalism department at Mexico's Center for Research and Teaching in Economics, known by the Spanish initials CIDE. At a polling place Sunday in Ecatepec, a poor suburb outside Mexico City, voter Mario Ruiz Bacera, echoed that sentiment. He said he not only voted for but also for every other candidate running on the Morena ticket. "You have to give him the whole car or they'll just put the brakes on his agenda," Ruiz said. His critics long have warned he is a leftist firebrand who will spell big trouble for Latin America's second-largest economy, with Venezuela-style socialist policies. In his speeches, the leader — commonly known by his acronym nickname "AMLO" — has consistently assailed elites he considers the "mafia of power." He pledges to audit foreign energy contracts reached under outgoing President Enrique Peña Nieto and to review any future ones. But López Obrador, who will assume office in December, has tempered his message on some issues in his third presidential run. He says he will not nationalize companies. And while he used to vow to pull out of the North American Free Trade Agreement or NAFTA, now he says he will try to keep it. "The new government will maintain fiscal and monetary discipline," López Obrador told supporters packed into a downtown hotel ballroom. Minutes later, the president-elect added that he will double pensions for the elderly, give education scholarships to the young and aid the disabled. And he repeated what he called his basic political tenet: "We will provide for the good of everyone, but the poor come first." The incoming president has a lot of different sectors of society to satisfy. To get elected this time, after failed presidential runs in 2006 and 2012, López Obrador reached out to a disparate group of political interests — from veteran leftists and labor unionists to staunchly conservative evangelical Christians. He will also have to balance Mexico's precarious relations with the United States and its president. That will be a difficult task, says Bravo Regidor of CIDE. He says that the president-elect at heart is an economic nationalist. "That doesn't mean that he is against NAFTA or anti-globalization or anti-American. It just means that he is aware of the fact that NAFTA hasn't been all roses and rainbows for Mexico," says Bravo Regidor. López Obrador insists he will be a tough negotiator with Trump and will get the respect from the U.S. president that his predecessor couldn't. Eric Olson, deputy director of the Latin American Program at the Wilson Center in Washington, D.C., says Mexico's next president is in a tricky spot when it comes to balancing relations with the U.S. and appeasing critics at home. "He has to walk the fine line between those who want a more assertive approach to Donald Trump and the pragmatic need to continue cooperation," Olson says. What's more, if Mexico's incoming president is to fulfill his primary campaign pledge to crack down on corruption, Olson adds, he'll need U.S. intelligence and cooperation to make that a reality. All right. Well, in addition to interviewing possibilities for the Supreme Court today, President Trump also says he spoke for about 30 minutes today with Mexico's president-elect, Andres Manuel Lopez Obrador. PRESIDENT DONALD TRUMP: We talked about border security. We talked about trade. We talked about NAFTA. We talked about a separate deal, just Mexico with the United States. We had a lot of good conversation. KELLY: Trump says he thinks the relationship will be a very good one. Lopez Obrador is a leftist populist. He has pledged to stamp out corruption and violence, both of which are rampant in Mexico. His victory yesterday was overwhelming. He got more than half the votes cast in the election. Here's NPR's Carrie Kahn. 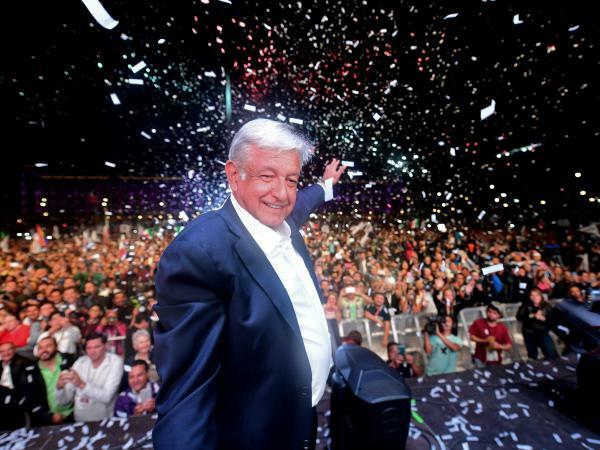 CARRIE KAHN, BYLINE: Andres Manuel Lopez Obrador won big. Not only did his new party, which is only four years old, take the presidency, it grabbed five governor's races and will be the biggest voting bloc in Congress. Since Mexico began its democratic opening in the late 1990s, no Mexican president has had such an overwhelming electoral mandate. Carlos Bravo Regidor, a professor at CIDE, a public research center in Mexico City, says the voters definitely expressed their anger with the political establishment, but they did not abandon democracy. CARLOS BRAVO REGIDOR: Let's elect the principal opposition leader. And, you know, let's give him enough power to gather enough political capital to really push through, you know, a new agenda. KAHN: Voter Mario Ruiz Bacera says that's why he went for every candidate running under Lopez Obrador's MORENA party too. MARIO RUIZ BACERA: (Speaking Spanish). KAHN: "You have to give them the whole car, or they'll just put the brakes on his agenda," says Ruiz. Just how far the president-elect will change Mexico's current establishment is unclear. His critics have long warned he's a leftist firebrand akin to Venezuela's Hugo Chavez who will dangerously pull Latin America's second-largest economy toward socialism. Last night, in hopes of calming international investors and markets, Lopez Obrador said he wasn't interested in expropriations or state control of the country's banks. ANDRES MANUEL LOPEZ OBRADOR: (Speaking Spanish). KAHN: "The new government will maintain fiscal and monetary discipline," he told supporters packed into a downtown hotel ballroom. Minutes later, the president-elect also said he will be doubling pensions for the elderly, giving education scholarships to the young and aiding the disabled. KAHN: "We will provide good to all. But," says Lopez Obrador, "the poor come first." It's clear the incoming president has a lot of different sectors of society to satisfy. To get elected this time, his third run for the presidency, Lopez Obrador united a disparate group of political interests, everything from veteran leftists to entrenched labor unionists to conservative evangelicals. He will also have to balance Mexico's precarious relations with the U.S. and President Trump - a tough task, says Carlos Bravo Regidor of the CIDE think tank, given that the president-elect at heart is an economic nationalist. REGIDOR: Although that doesn't mean that he's against NAFTA or that he is anti-globalization or anti-American. It just means that he's aware of the fact that, you know, NAFTA has not been all roses and rainbows for Mexico. KAHN: Lopez Obrador insists he will be a tough negotiator with Trump and will get the respect from the U.S. president his predecessor couldn't. Eric Olson of the Wilson Institute in Washington, D.C., says Lopez Obrador is in a tricky spot when it comes to balancing relations with the U.S. and appeasing critics at home. ERIC OLSON: He has to walk the fine line between those who want more assertive approach to Donald Trump and the pragmatic need to continue the cooperation. KAHN: Olson says, if the incoming president is to complete his primary campaign pledge to crack down on corruption, he'll need U.S. intelligence and cooperation to make that a reality. Carrie Kahn, NPR News, Mexico City. (SOUNDBITE OF JAGUARES' "SI FUERA NECESARIO") Transcript provided by NPR, Copyright NPR.